That fire is not the subject of this article, for it was only the second-worst (perhaps even third-worst) fire of that terrible evening in loss of life. Who’s Heard of Peshtigo, WI? The greatest fire in terms of loss of life happened that same night in Peshtigo, Wisconsin and surrounding areas. The Great Peshtigo Fire of 1871 resulted in the deaths of between 1,200 and 2,500 people (800 in Peshtigo alone), and is the deadliest fire in U.S. History. Because the fire was mainly rural, it is called a forest fire in many sources. Fires had actually been burning in the Peshtigo area for weeks, but due to extremely hot and windy conditions Sunday night, these merged and grew into a firestorm which engulfed Peshtigo on October 8. The Peshtigo fire scorched about 1.2 million acres of land, and actually jumped Green Bay to burn parts of Door and Kewaunee counties on the Door Peninsula. From the survivors, we glean the following in reference to the scene at the village and in the farming region commonly known as the “Sugar Bush.” Sunday evening, after church, for about half an hour a death like stillness hung over the doomed town. The smoke from the fires in the region around, was so thick as to be stifling and hung like a funeral pall over everything and all was enveloped in Egyptian darkness. Soon, light puffs of air were felt, the horizon at the south east, south and south west began to be faintly illuminated, a perceptible trembling of the earth was felt, and a distant roar broke the awful silence. People began to fear that some awful calamity was impending, but as yet, no one even dreamed of the danger. The illumination soon became intensified into a fierce lurid glare, the roar deepened into a howl, as if all the demons from the infernal pit had been let loose, when the advance gusts of wind from the main body of the tornado struck. Chimneys were blown down, houses were unroofed, the roof of the Wooden Ware Factory was lifted, a large ware house filled with tubs, pails, [kanakans? ], keelers and fish kits was nearly demolished, and amid the confusion terror and terrible apprehension of the moment, the firey element in tremendous unrolling billows and masses of sheeted flame, enveloped the [doomed?] village. 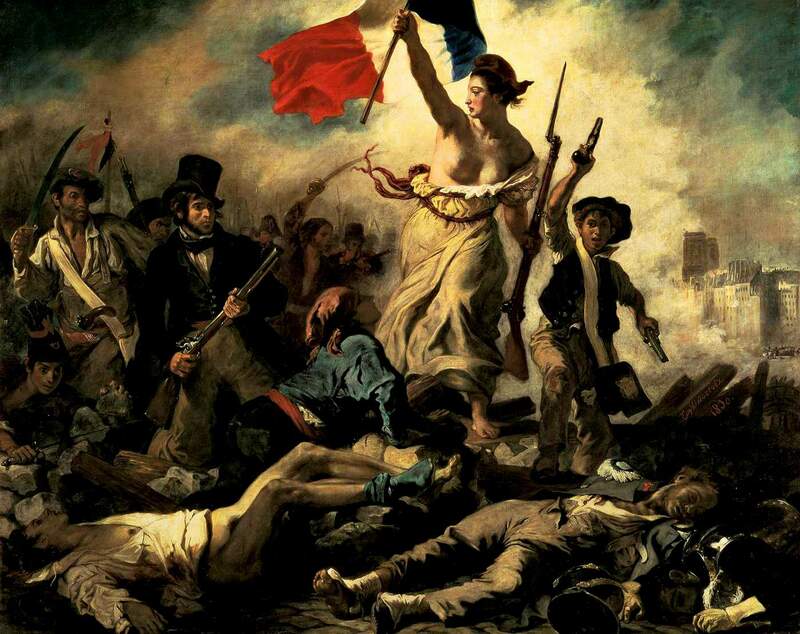 The frenzy of despair seized on all hearts, strong men bowed like reeds before the firey blast, women and children, like frightened spectres flitting through the awful gloom, were swept like Autumn leaves. Crowds pushed for the bridge, but the bridge, like all else, was receiving its baptism of fire. 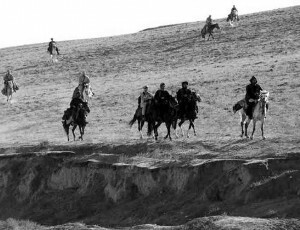 Hundreds crowded into the river, cattle plunged in with them, and being huddled together in the general confusion of the moment, many who had taken to the water to avoid the flames were drowned. A great many were on the blazing bridge when it fell. The debris from the burning town was hurled over and on the heads of those who were in the water, killing many and maiming others so that they gave up to despair and sank to a watery grave. 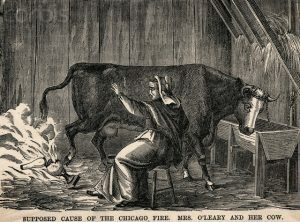 Vox’s Take: You should know that a newspaper reporter admitted to making up the story of Mrs. O’Leary’s cow starting the Chicago fire. Even though the story was debunked almost immediately, it has survived all these years – some sources still casually cite the actions of this supposed bovine arsonist as fact. The newspaper article quoted above conveyed better than I could the horrific situations these people experienced. The Great Peshtigo Fire of 1871, Deana C. Hipke. 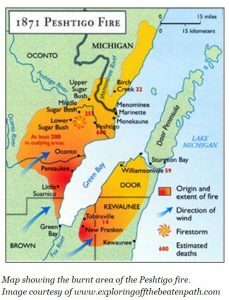 The Great Peshtigo Fire of 1871. Let’s face it: Americans are prudes. I first learned this when traveling overseas, and found that people from other countries are not freaked out about exposed skin the way Americans are. For example, in South Africa, people did not need changing tents on the beach, they simply changed into their swimsuits. And no-one cared. The little kids ran and played on the beach naked. And no-one cared. In America, people would be scandalized. It wasn’t always that way, but it seems Victorian sensibilities have been stuck in our society for quite a while, at least among the more conservative elements. Refer to this amusing bit of prudery. 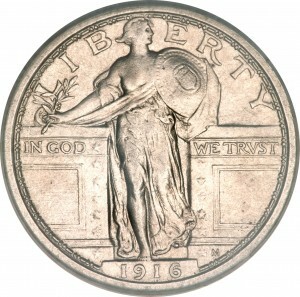 Original Standing Liberty quarter with breast exposed. Redesigned Standing Liberty quarter with chain-mail vest. Perhaps making a veiled statement about the hub-bub, the sculptor, Hermon Atkins MacNeil, corrected the situation by depicted Liberty wearing a chain-mail vest covering the offending torso up to her neck, rather than simply rearranging her gown. You should know there is an alternate version to the story. Some historians don’t accept the “public outcry” explanation. You see, in 1916 America was very concerned about defense and was about to reluctantly enter World War I. In this atmosphere Liberty was depicted in a defensive posture (note that she’s holding a shield). 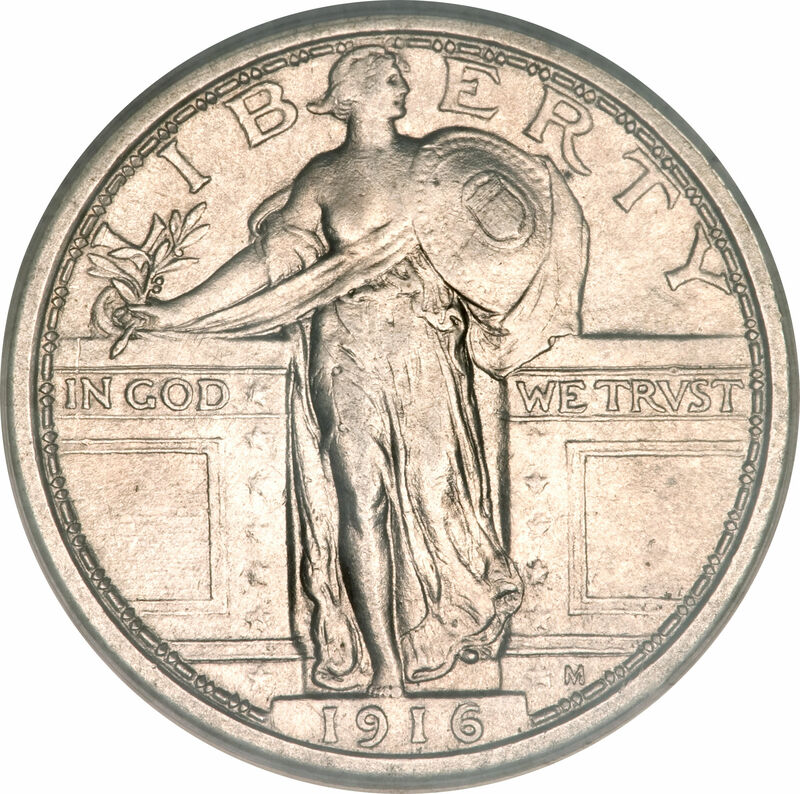 The Mint may have belatedly decided it was inconsistent for Liberty to be so vulnerable in her dress and should be better protected. 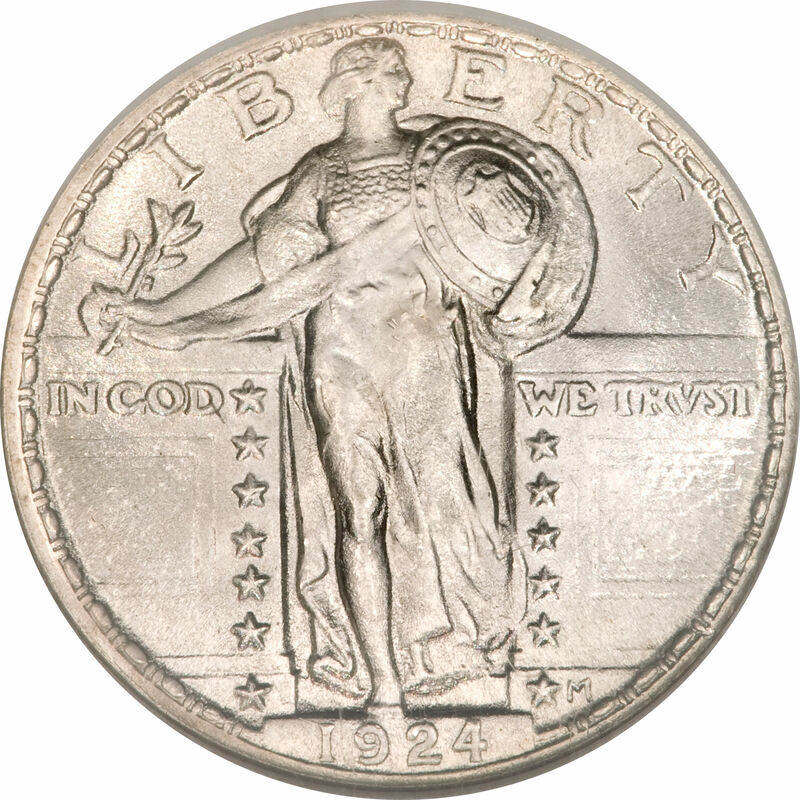 To me, the addition of the chain-mail vest is the inconsistency, since the shield, depicting defense, is on the left side of the figure, while Liberty’s right side, where she’s holding an olive branch, represents peace. Also, if the officials at the Mint thought there was a design inconsistency, why would that have not been fixed before going into production? 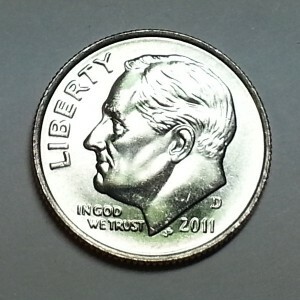 An ironic side-note is that, due to the quick design change, the “breast-exposed” quarter became an immediate collector’s item. Other countries are not so worried about Liberty’s modesty. Liberty is shown breaking the chains of tyranny in this Chilean 10 Pesos coin. 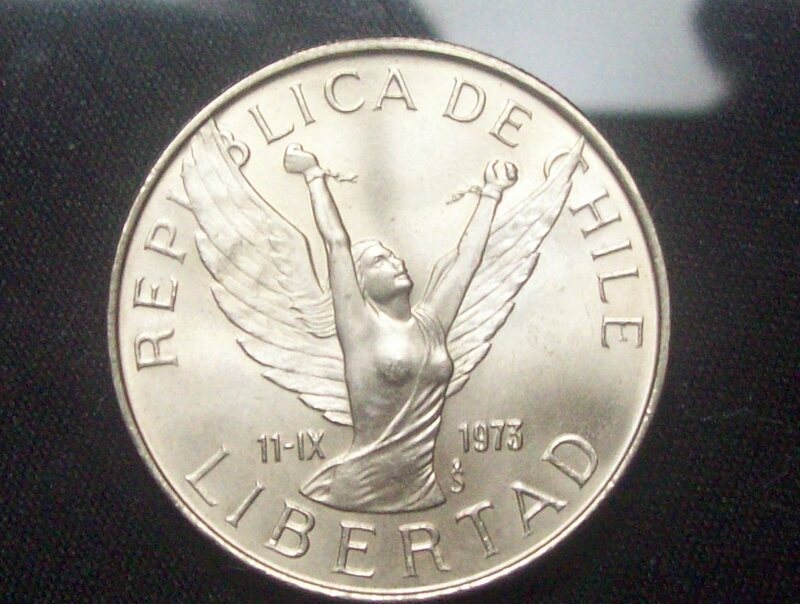 Note these coins from Mexico and Chile depicting a winged Libertad. No worries here about using the classical form. 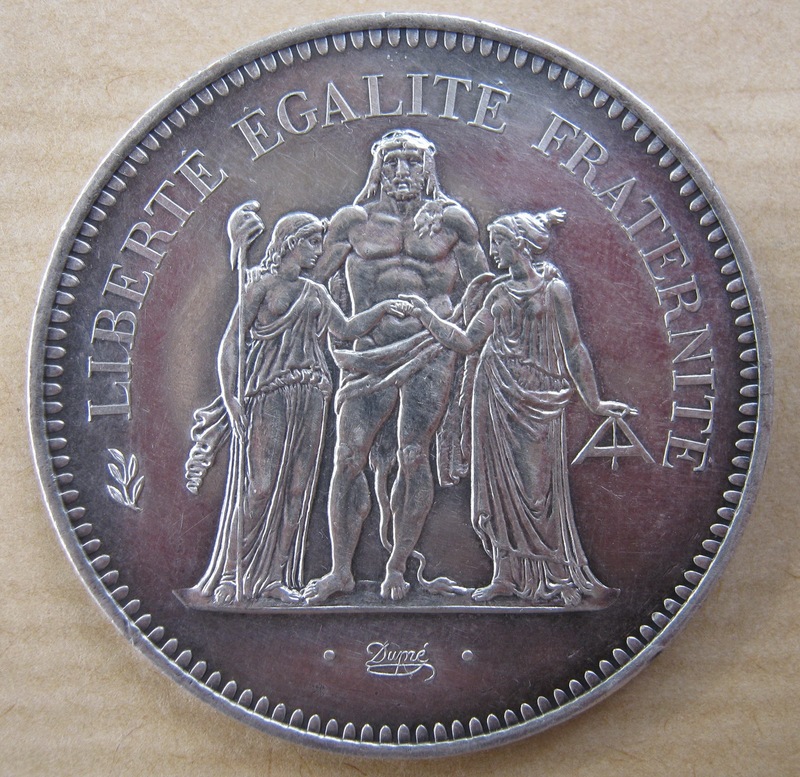 On the French 50 Francs coin, Liberty (on the left) stands with Hercules and Justice. 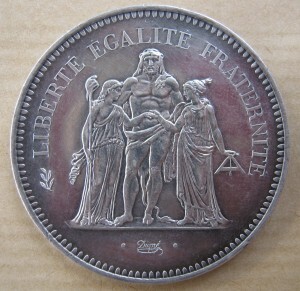 See also this French coin with Liberty (the figure on the left holding a Liberty Cap on a pole) next to Hercules and Justice. 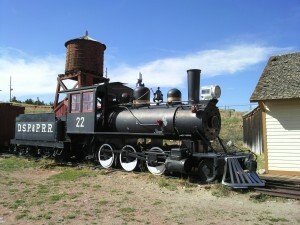 I took this shot of a steam locomotive on my recent visit to South Park City, a re-creation of an early Colorado mining town. This locomotive, painted to represent an engine of the Denver, South Park and Pacific Railroad (D.S.P.&P.R.R. ), is a survivor of the era of the “Narrow Guage” railroads. In Colorado we hear about narrow guage all the time, but for those of you not familiar with narrow guage, this refers to the distance between the rails of a railroad track. Standard guage is 4 foot, eight and 1/2 inches between the rails’ inside edges, where the width of a narrow guage track might be 3 foot or less. The narrower guage allowed the train to make sharper turns, necessary in the mountains where digging railroad grades was enormously expensive. The depot’s large red tank in the background held water to fill the steam locomotive’s boiler; and the black car immediately behind the engine held wood or coal for keeping the engine’s fire box fed. Good Friday – the Friday before Easter, has not been so good for the residents (human and otherwise) around Prince William Sound, Alaska. Two disasters, 25 years apart, continue to leave their mark on the area. 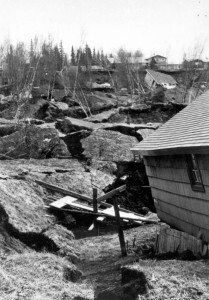 The first, which occurred on Friday, March 27, 1964, was the Good Friday Earthquake, also called the Great Alaska Earthquake of 1964. At 9.2 on the moment magnitude scale, this was the most powerful earthquake ever recorded in North America, and the second-most powerful in the world. I remember watching a documentary on this earthquake many years ago (sorry, I can’t remember the name), where a man was describing the scene during the 4 to 5 minutes of shaking: “You think of the ground as being solid. I looked out, and saw the ground rolling like the waves of the ocean.” A woman tearfully described seeing a fissure in the ground open up, her son fall in, and then the ground close up again. However, the earthquake had a very low fatality rate due to the sparsely populated area where it occurred, and the fact that most buildings in the shaking zone were made of wood. Most of the 131 deaths actually resulted from the ensuing tsunami, which killed people in Alaska, Oregon and California. One of the highest fatality areas was the dock area of the port of Valdez, where a section of land 4000 feet by 600 feet slid into the ocean. The ground was permanently raised in some areas by as much as 30 feet, and lowered in other areas by eight feet. The town of Portage on the Turnagain Arm was lowered to below sea level, and so had to be permanently abandoned. The village of Chenega was destroyed by the tsunami and 23 of the 68 inhabitants killed. 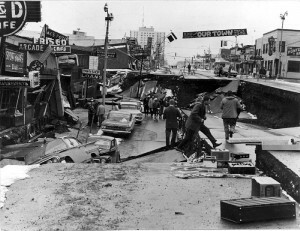 The downtown area of Anchorage experienced heavy damage. Seeing the second story of some buildings at street level makes it a wonder to me that more people weren’t killed. The effects of the earthquake were felt worldwide: “Seiches, a sort of sloshing of water back and forth in a small body of water like a boat harbor or swimming pool, were observed as far away as Louisiana where a number of fishing boats were sunk. 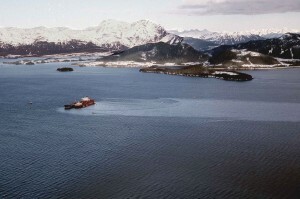 Oscillations in the height of water in wells were reported from as far away as South Africa.”  An asphalt storage plant near Valdez was destroyed, spilling an unknown quantity of asphalt into Prince William Sound. With the area inundated with relief efforts pertaining to the earthquake and tsunami, no particular clean-up effort was attempted for this spill. Today, remains of the asphalt spill are mixed with remains of another spill , which brings us to the second Good Friday disaster. Vox’s Take: Sadly, the infamous Exxon Valdez Spill is dwarfed by the Deepwater Horizon Spill of 2010, which spewed an estimated 218 million gallons of crude oil into the Gulf of Mexico. Given the Exxon example, and the ability of huge corporations with their teams of lawyers to avoid accountability for their misdeeds, its seems unlikely that British Petroleum (BP) will end up paying for more than a small fraction of the damages. 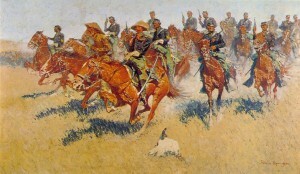 The swarm was observed by Dr. Albert Child of the U.S. Signal Corps in 1875, remembered by midwest farmers as the Year of the Locust. From timing the swarm as it passed overhead for five days, and telegraphing associates in other towns, Dr. Child estimated the size of the swarm as 1,800 miles long and at least 110 miles wide: 198,000 square miles containing 3.5 trillion grasshoppers! Swarms of locusts, though not usually this size, descended on farming communities from Texas to Minnesota like a Biblical plague, eating every green thing in sight. When the plants were gone, the hungry insects ate leather, cotton and wool (still on the sheep). Housewives vainly placed blankets over their gardens. The pests ate the blankets, then the gardens. A swarm of locusts devastates the family farm in Laura Ingalls Wilder‘s book On the Banks of Plum Creek. After this biological tsunami passed through, the crops were devastated and the settlers faced starvation, forcing the Federal and state governments to supply the stricken pioneers with food, clothing and seed for replanting crops. So why don’t you hear about these critters now? Because, in the space of 27 years, the Rocky Mountain Locust population went from an estimated 15 trillion to… zero. Nada. Extinct. The last known pair was collected in 1902, and is now at the Smithsonian Institution. The species was declared extinct in the 1950’s. How can such a thing happen? Just as “being smart is no guarantee against being dead wrong” – Carl Sagan, it turns out that large numbers are no guarantee against a spectacular decline. 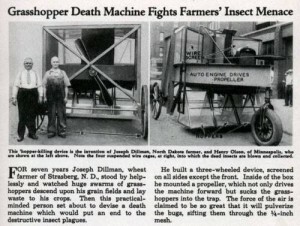 During the settlement period of the midwest, farmers tried many contraptions to try to eradicate the grasshoppers. It was like trying to empty the ocean with a teacup. However, the species had an Achilles heel, and that was: like Monarch Butterflies, after the swarming phase the population naturally declined and retreated to its breeding grounds. In the case of the Rocky Mountain Locust this was the fertile mountain river valleys. The whole population of these grasshoppers in this phase of their life cycle could fit into a 20-mile diameter circle. It just so happened that the farmers who were so chastised by the locust were plowing up these same river valleys, and in the process, inadvertently decimating the locust’s breeding grounds. Farm records from the late 19th Century tell of plowing up egg sacs by the thousands during the spring planting. And so the grasshoppers died. It is one of the few agricultural “pest” species to have been eradicated, and it was done by accident. Vox’s Take: Accidental demise or not, the story of the Rocky Mountain Locust is a cautionary tale we should heed. Life on this third rock from the Sun can be more fragile than is commonly supposed. Most aviation records set in the pioneering first half-century of manned flight were accomplished after months or even years of careful planning, funding, determination and daring. 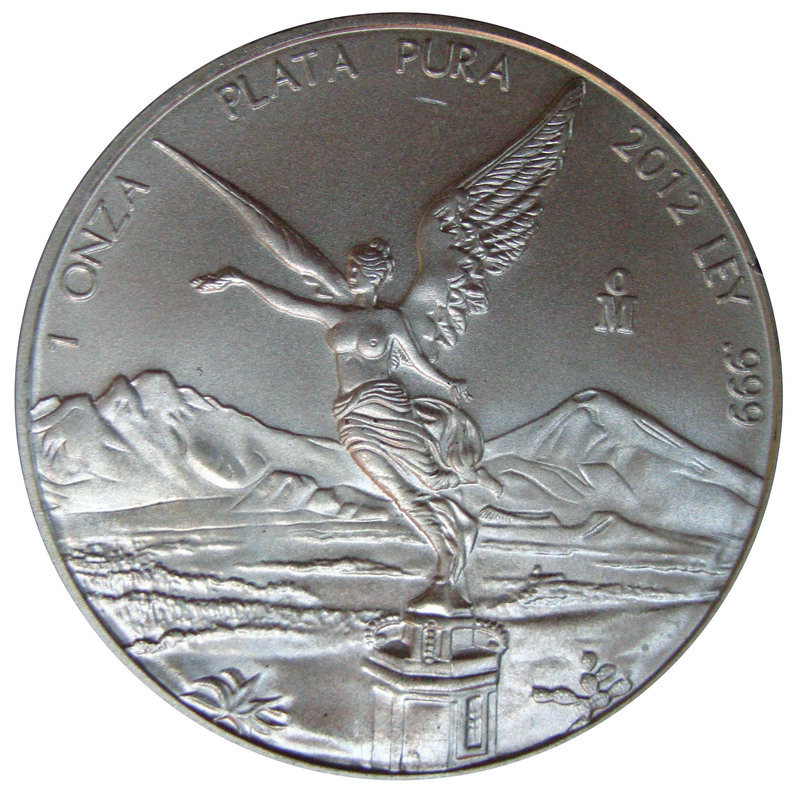 Often the aviators and their backers were in pursuit of prize incentives offered by newspapers, aviation societies or wealthy enthusiasts. Sometimes, the aircraft was specially designed and built for a single attempt at a record. 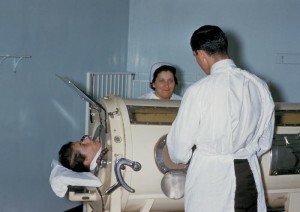 A great example is the Ryan NYP (New York to Paris), dubbed the Spirit of St. Louis to recognize the financial backers. Charles Lindbergh piloted the Spirit of St. Louis in 1927 in the first successful attempt at a solo non-stop crossing of the Atlantic and claimed the Orteig Prize. Such was not the case with the first round-the-world trip by a commercial airliner. 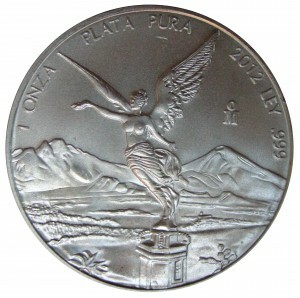 In fact, when the crew of Pan Am’s California Clipper left Los Angeles on December 2, 1941 for a regularly scheduled round-trip flight to Auckland, New Zealand, they had no idea they were going to set an aviation record, that they were going to go around the world, and that they would be gone from home five weeks. The California Clipper, a Boeing B-314, was one of Pan Am’s famous fleet of China Clipper ships: flying boats designed for long-range flights over the ocean. In the 1930’s, the public was more apt to trust a flying boat in trans-oceanic travel because if there were engine troubles or navigation errors, the aircraft could land on the water. This was not a trivial concern at the time – air travel over the ocean was still a new and somewhat unproven method of getting from one shore to another. For the passenger service operators, they could extend their service to any city with a sheltered harbor, in the days when adequate airports with long runways were scarce. Marketed to the super-rich, the Pan Am China Clippers represented the pinnacle of luxury air travel and the fastest way to get over the ocean. 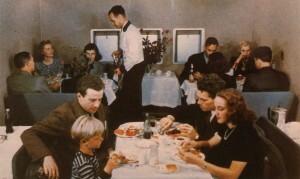 The California Clipper had one class of service, and that was first class. In comparative dollars, a flight on a clipper was more expensive than flying the supersonic Concorde sixty years later . So how did the California Clipper come to set a record for traveling around the world? What happened was the Japanese attack on Pearl Harbor, which occurred on December 7th, when the clipper was en route to New Zealand. When they landed at Auckland, the captain and crew discovered they were in the middle of a war zone, in possession of a large and valuable aircraft, and easy prey to Japanese fighters. 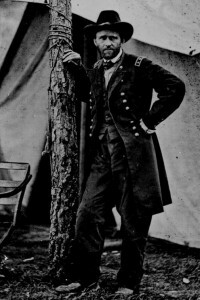 Ruling out a return trip by the way they had come, Pan Am instructed Captain Robert Ford to continue flying westward. There had been no plan for this of course, so there were no navigation maps, no carefully scouted re-feuling stops, no waiting maintenance hangars. Leaving Auckland and headed west, the clipper began a month-long odyssey characterized by hazards, improper fuel, overloaded take-offs and close calls with the enemy (at one harbor they were confronted by a Japanese submarine, and had to beat it to get out of the range of its’ guns). With grit and determination, Captain Ford and the crew were able to finally bring the clipper home to the Marine Terminal at La Guardia Field, New York on January 6, 1942. 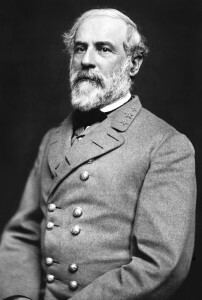 “The flight was a thirty-four day ordeal. It took over 31,000 miles, 3 oceans, 5 continents, 12 nations, 22 landings, and crossed the equator 4 times.”  After the California Clipper was safely brought home, Pan Am renamed it the Pacific Clipper, partly due to the media attention it was receiving. 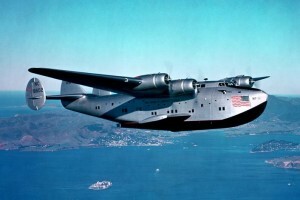 Soon after, the Pacific Clipper, along with all of Pan Am’s flying boats, was requisitioned by the Army Air Force for military duty, although it continued to be flown by the experienced Pan Am crews. After the war, the concept of the commercial flying boat gave way to land-based airplanes, and the now-obsolete Pacific Clipper was sold to Universal Airlines. It never flew commercially again, however: it was heavily damaged in a storm and consequently sold for scrap. 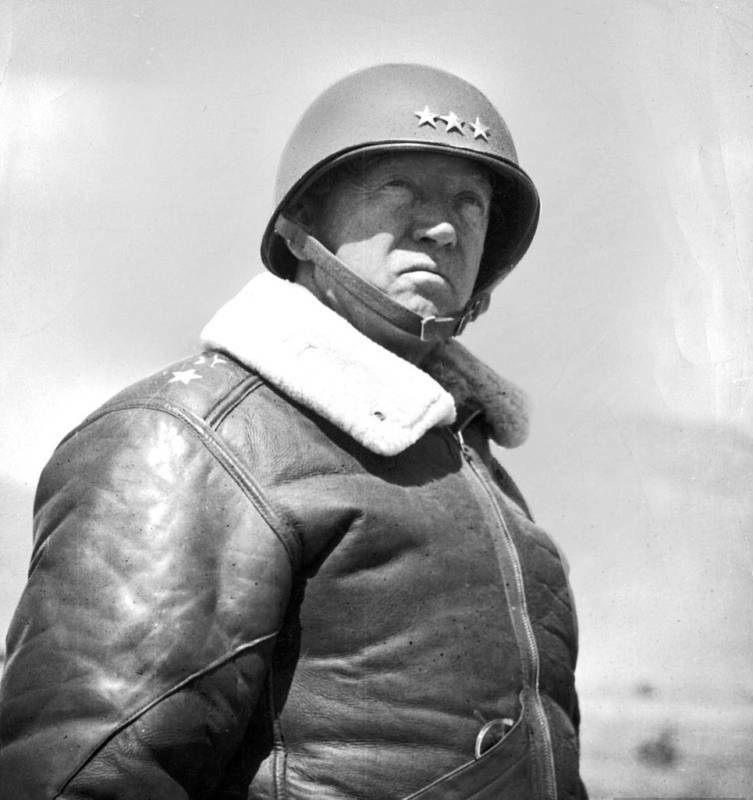 Vox’s Take: Sadly, none of the Boeing B-314s survive today. There is, however, a full-scale mock-up at the Foynes Flying Boat Museum in Limerick, Ireland  – one of the terminals for the Pan Am clippers flying Atlantic routes.